Last year the MacBook Pro with Retina display was a disappointment for the guys at iFixit in terms of repairability. And after they had torn down both the 13-inch and 15-inch Retina MacBook Pro introduced a couple days ago, they found that things have got slightly worse — once again in terms of repairability. Here is why. Those who care about repair, and who are after a 15-inch MacBook Pro, had better look up on eBay some of the older models, because Apple has stopped selling the non-Retina 15-inch model. The bad news is that Apple has made both models as irreparable as they could: they even soldered the headphone jack to the logic board. In other words, unless you have some soldering skills, replacing the headphone jack will cost you roughly $1,000, because you will need to replace the whole logic board. Another thing noticed by iFixit is that the batteries in both 13-inch and 15-inch models have actually shrunk, which suggests that Apple is relying more on the performance of the Haswell processors, as the MacBook Pros still come with an 8–9 hours of battery life. 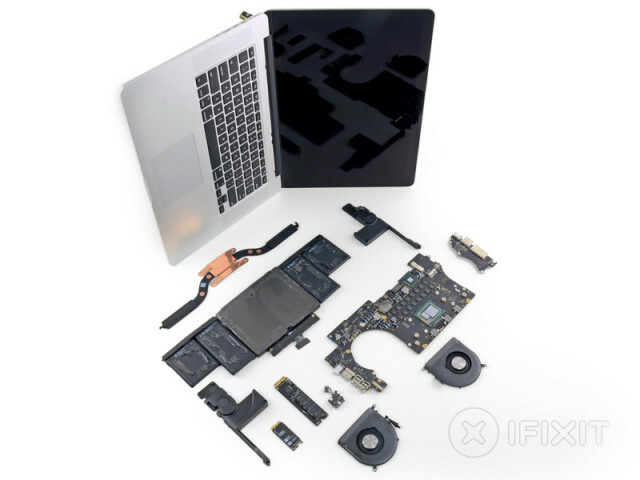 After taking the 15-inch MBP apart, iFixit found that it is essentially the 2012 unit with a couple of performance upgrades. Here are some highlights of the 15-inch Model. As in the MacBook Air, the RAM is soldered to the logic board. Max out at 16GB now, or forever hold your peace—you can’t upgrade. The proprietary SSD has changed to a PCIe format, but still isn’t a standard 2.5″ drive. However, it is a separate daughtercard, and we’re hopeful we can offer an upgrade in the near future.